With a humble beginning, we started our business in a market yard in Armagh in 1978, with an ambitious plan to build an innovative and service-driven company. 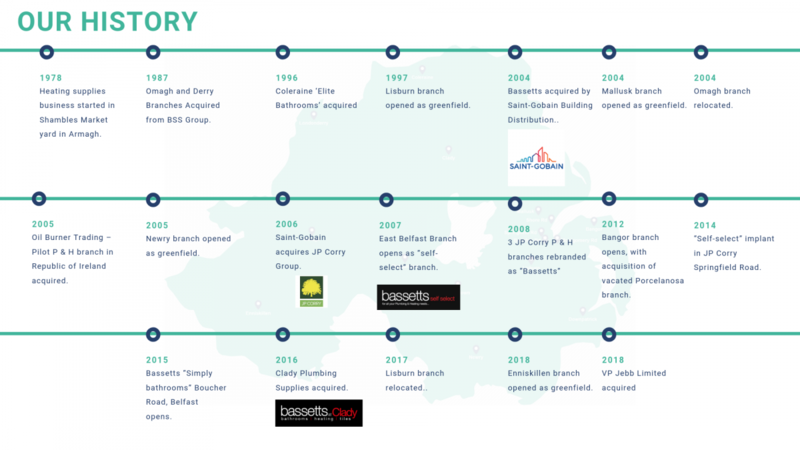 Now, 40 years on, we have become an award-winning plumbers’ merchant with 16 branches covering every county in Northern Ireland. We are known for supplying quality plumbing, heating, bathroom and renewable energy solutions, to the trade and public. For those larger projects, our commercial team are happy to advise and support you. We have the perfect balance between being focused on Northen Ireland while also reaping the benefits of being part of the Saint-Gobain Group, with over 170,000 employees throughout 68 countries. Our reputation for exceptional customer service and our close operational structure empowers your local branch, giving you a responsive and tailored service. We offer immediate and easy access to a wide range of plumbing, heating and renewable products. Our customers know that we are a people business; our customer’s come to us and stay with us because we have knowledgeable staff that are very much a part of your local community.